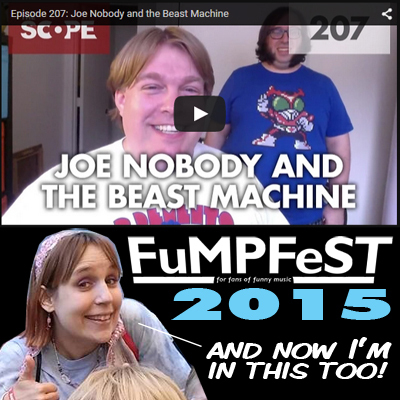 It’s our second annual recap of the events of FuMPFeST! Luke & Carrie break down their weekend at the Funny Music Project Festival for 2015 from each of their points of view; Carrie’s done while managing a toddler, and Luke’s done while managing the fact that this was the first time he has visited home since heading off to Cartoon-land. 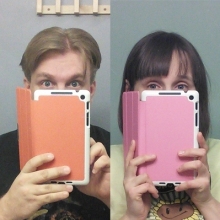 Following that, Carrie and Luke take turns getting caught up with other cool events of their respective past June, including Carrie’s lap-dance-tastic time at a “Weird Al” concert, and Luke’s first ever time recording voices for animation at a “Mighty MagiSwords” session. Inspired by the Scope podcast’s Episode #207 YouTube thumbnail image of Luke & Kyle coupled with their episode title “Joe Nobody And The Beast Machine” across their chests (which I assume is the maniacal workings of Jared Ringold), Luke and Kyle decided that “Joe Nobody And The Beast Machine” are their A.M. Radio Disc Jockey Personas, which we shift into frequently during the “What’s Luke Plugging Now?” segment. This episode’s comedy & music tracks are by some combination of TV’s Kyle featuring Lindsay Smith, Joe Caruso, Scooter Picnic, Carrie Dahlby, the great Luke Ski, Slick Rick & Doug E. Fresh, Devo Spice, Rhett & Link, Insane Ian featuring Bonecage, Whitney Avalon & Yvonne Strahovski, Michael Aitch Price And His Musical Miscreants, Ookla The Mok, Eddie Lawrence, Whimsical Will, “Blasted Bill” Putt featuring Cirque du So What?, Stephen Colbert, & Eclectic Method. Indicators seem to indicate that this podcast has become monthly, and each episode will be nearly 4 hours long. We’ll all just have to wait and see if that remains or not. So step on up and get’cher content, internet consumers! Not sure if it was just me since I was outside listening on headphones, but during the second segment (and I think third too, though I could be remembering wrong) Luke’s volume would go way down while he was talking. I could still him, but only just. Carrie I could hear just fine the whole time. If it’s just me, maybe that means I need new headphones, and feel free to disregard. 4! is four factorial, which is equal to 24. I thought everyone did the four fours thing in grade school. It’s always fun to hear about Luke’s adventures in TV land. Can hardly wait until the new Magiswords stuff starts coming out!